Last night I made this little 7″ cheesecake. 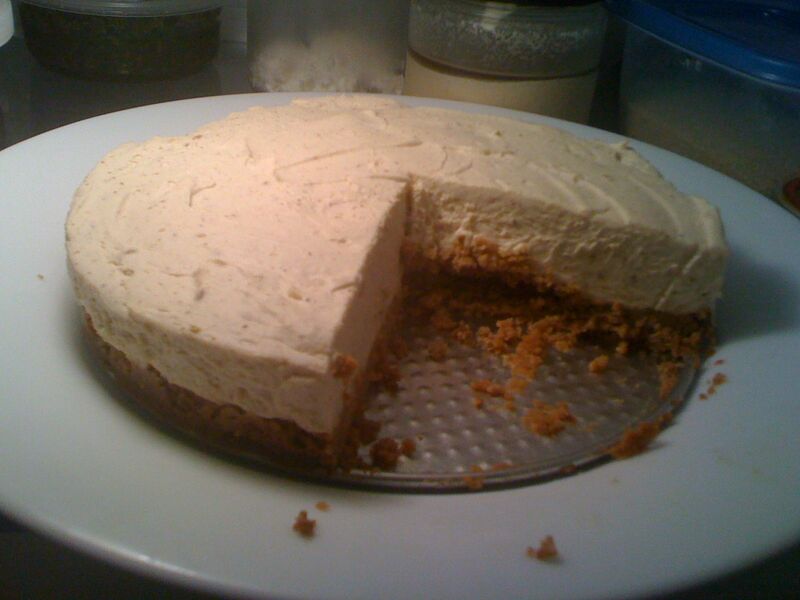 It’s an Almond Butter No-Bake Cheesecake with Brazil Nut Crust. And it’s super simple. I used the recipe from Cottage Magpie as my base recipe and added to it. I used the nut crust recipe from Nourishing Traditions but modified it. My husband loves cheesecake and he was a fan! And he said he wanted more. It’s more-ish! Yay! That’s the best compliment, I think – when your husband wants more of the food you make him. This cheesecake is primal (not paleo because it uses dairy) and it’s sugar-free! Yay stevia! “Primal Cheesecake” is kind of an oxymoron but who’s counting…? What’s the recipe? Here it is! Grind brazil nuts in food processor until a wet paste. Add the rest of the ingredients. Mix well. Press into oiled and floured spring-form pan. Bake in 325’F oven for 25 minutes. Cool. Whip the cream until stiff in a large bowl. Set aside. In a food processor, process the rest of the ingredients until well mixed and fluffy. Add cheese mixture to whipped cream. Whip well until smooth. Pour over chilled crust in spring form pan. Chill for 3 hours. If you haven’t made a nut-crust before, you might be nervous that it’s not as good as “the real thing” but I can assure you that it’s every bit as satisfying! Next time I’m going to try decreasing the cream and increasing the cheese just to see if it gives me more of a cheesy flavour. What a fabulous cheesecake and one I can actually make and eat!! Thank you for experimenting and coming up with this recipe….it looks divine and is on my list. I don’t think I want to run in them as of now, but perhaps in the near future. They look fabulous and it sounds as if they actually work! !